When the clients of this backyard project on Bell Mountain Drive came to us to complete a third phase of remodeling work in their home, we took it as a challenge to ourselves to make this their favorite room of the house. I know, you think I misspoke calling the backyard a room, but that is just what we set out to do. The clients’ two complaints with their existing pool and back patio were it was so hot, you were either in the pool or baking in the sun, and the featureless nature of the previous owners’ finish out of the pool, patio, and backyard was unattractive. We wanted to change that, making their backyard an oasis and retreat from the inside of the house. 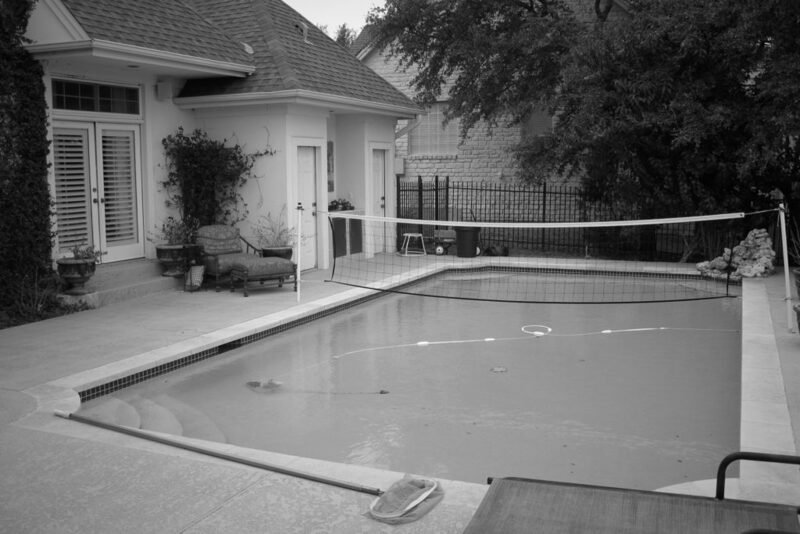 The existing “cool deck” pool surround, besides being bland and stark white, was anything but cool on your feet, and the rotten wood trellis and composite decking were unsightly and provided little relief from the hot Texas sun. Our first obstacle was to tackle the clients’ desire to cover and extend the existing patio in a manner that would blend with the existing house, while enhancing the appearance. With exposed stained double Douglas fir rafters, custom scissor trusses at every third interval, and stained v-groove cypress soffit decking, the once featureless exterior of the home now had a focal point to base the rest of the design around. 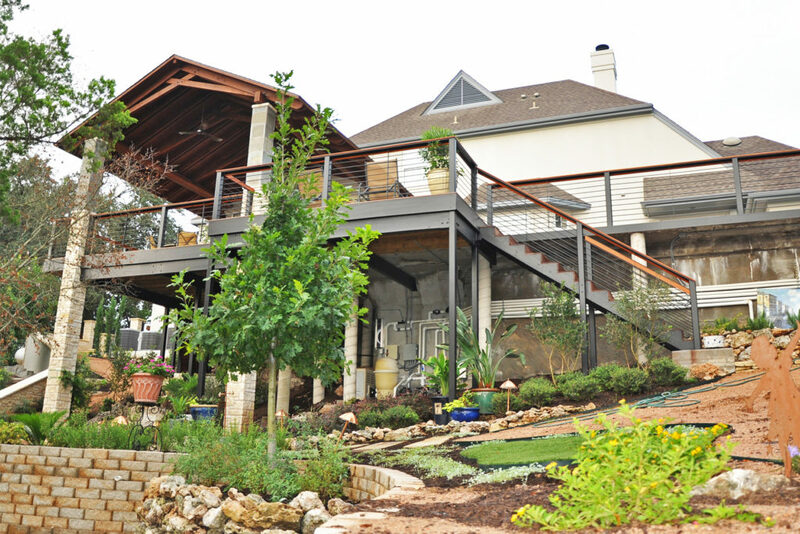 *Tiger wood decking, limestone columns, and custom steel round bar handrail with tiger wood cap turned their rotting deck in to a color rich environment. Specialty lighting fixtures included a fluorescent light trough to up-light the decorative rafters and trusses, Bevolo gas copper lanterns on the columns, and Cooper Lumiere accent lights over the doorway and stairs to the backyard. The existing pool surround was topped with 2” thick, 4’x4’ salt finished stained concrete pads with synthetic turf grass borders to break up the large expanse of concrete. Special channels left below the turf grass with stone pebbles help drain run off water to its existing natural paths. At one end of the pool, a shallow wading pool was cut out of the concrete deck to give guests a place to sit in the shade with their feet in the water, directly off of the covered patio. At the other end, a small distasteful rock fountain was replaced with a large cut stone fountain wall and retaining pool with custom copper overflow scuppers that feed in to the pool. The clients’ second desire on the much needed update list, the backyard, was once just an undeveloped slippery slope, traveled only to access the pool equipment. Now a destination full of greenery and opportunity to relax in tranquility, the once inaccessible space was made level by adding and filling in multiple retaining walls that allow a smooth transition from the patio to the backyard. As for the pool equipment, updated technology and convenient on-off switches located on the patio columns for the fountain and pool pumps leave the homeowner making fewer trips down the stairs, though when he has to it will be a much safer trip. Many difficult obstacles were encountered and overcome in this successful backyard transformation. 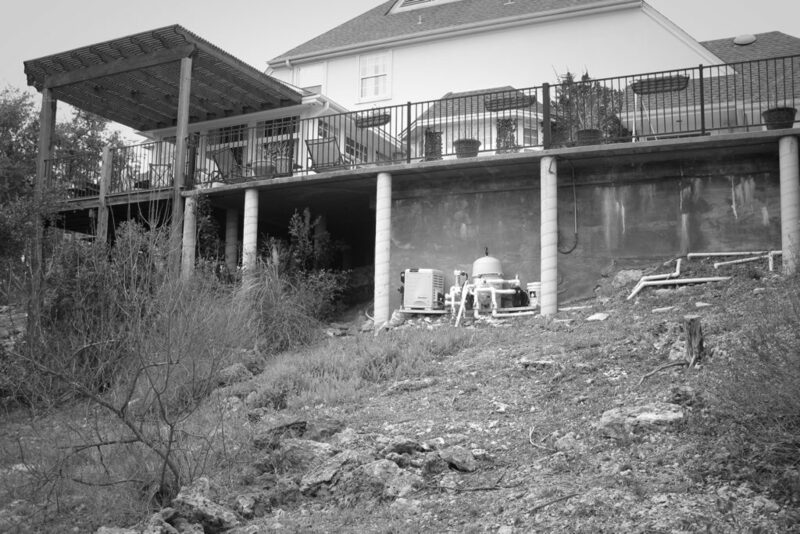 Some of the most challenging included building a ramp and retaining walls over rocky terrain stout enough to give the bobcat access to the backyard, supporting the existing above ground concrete pool deck when an 8’ square opening was cut out for the wading pool, working off of scaffolding 40’ in the air supported on an uneven 30 degree slope to build the patio, columns, trusses and roof covering. What was once just an aboveground pool surrounded by an expanse of concrete that didn’t do this scenic site justice, now is a colorful destination for parties and outdoor living that will leave the inside of the house feeling lonely.